The title image on the left is a detail from an engraving entitled "The Town of West Cowes", which formed part of a collection of prints called "Vectis Scenery" by George Brannon and published in 1848. The windmill that stood at the top of modern Mill Hill Road is clearly shown. But further down the slope of the hill appears an intriguing structure, similar in shape to the body of the windmill. Referring to this Brannon print, Kenneth Major, in his Mills of the Isle of Wight, writes, "... a tower is shown below this windmill which, although it looks like a windmill, is not known to have been a windmill." Could this have also been another windmill and if so, what was its fate? Thomas Kelleway , his amazingly fertile wife and the shortest-lived windmill on the Isle of Wight. All that messuage or tenement with a piece of land thereto belonging situate in said Parish of Northwood as apportioned to said Thomas Kelleway in a partition and division of land by said Thomas Kelleway and Thomas Ayrton by Indentures dated 29th and 30th September 1802 and bounded by the other part of land apportioned to said Thomas Ayrton by said indentures on the east by a piece of parcel of a close therein after described on the west by land of Mr Thomas Day on the north and by Mr Edmund Green on the south. This indenture mentioned a "windmill", which was located on a plot of land called Maynards and, as will become apparent, was distinct from the windmill that was located at the top of Mill Hill Road. 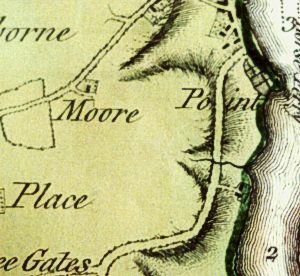 [Above] A detail from a map of the Isle of Wight, drawn by John Andrews in 1769. 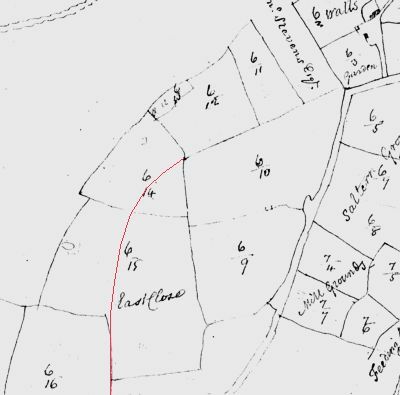 [Right] A detail from a map that accompanied a survey of the estates of Lord Edgcumbe in the Isle of Wight, made in 1771. The present Mill Hill Road is shown by the red line. This sketch map, which accompanied the Edgcumbe Survey, shows the fields belonging to the holding called 'Wall's Broadfields'. The fields that were later to be called Maynards and Maunds form one field numbered 6/10 but it was given no name. On the southern boundary of this field, a building (a barn?) is shown. This is significant as a barracks was mentioned at this site in the late 18th century during a period of high military activity. 1. House Yard Garden etc. In December 1799, Linn Ratsey sold his third share in Maynards to Kelleway and Ayrton for �0. A year later, in December 1800, Kelleway and Ayrton entered into an agreement whereby Maynards was split into two by a "rail fence" running from west to east. Kelleway received "All that the south or most southerly part thereof containing by admeasurement 2 1/2 acres or thereabouts together with a road or way 9 feet wide from the west end of the north part of the said close of arable land next adjoining the hedge and leading from the gate there to the said south part of the said close of arable land ..." [Lease and Release, 25 & 26 December 1800] Ayrton took the north portion. 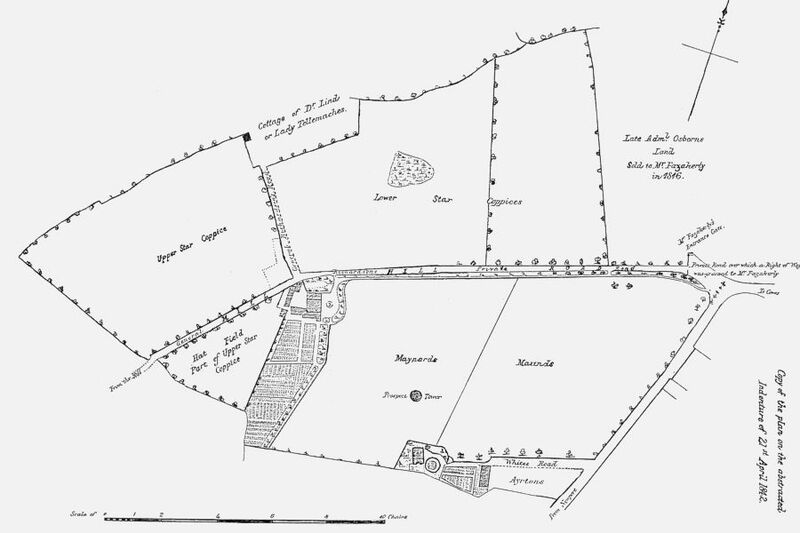 In January 1804, Kelleway borrowed �0 from Ayrton putting up his Maynard property as security. The indenture for this transaction is quoted at the start of this page. Possibly this was to allay the costs of building the windmill on part of Maynards close. Judging from the Poor Rate and Highways Collection books, the windmill seems to have been constructed in the summer of 1804. Thomas Kelleway was paying a rate for a mill from October 1804 onwards. Thomas Ayrton died in October 1806. Kelleway paid poor rate for the mill until 1807 [the last poor rate that Kelleway paid for the windmill was dated 24 April 1807], in which year he sold his property to Rear Admiral Samuel Osborn for �40. In the Poor Rate dated 1808 Feb. 25 [see above], the mill is listed under Admiral Osborne's name and is described as "Void". It is from the date of Kelleway's sale of lands to Osborne that the mill becomes disused, continuing to earn the label 'void' in subsequent poor rate valuations. The last inclusion of the mill among valuations for Admiral Osborne is 7 April 1809, after which date it is never mentioned. Kelleway's windmill was therefore in working existence as a corn mill for only about two to three years! 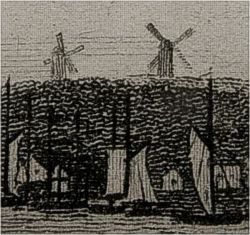 [Left] Engraving of West Cowes showing the two windmills. [Above] Detail from same engraving. 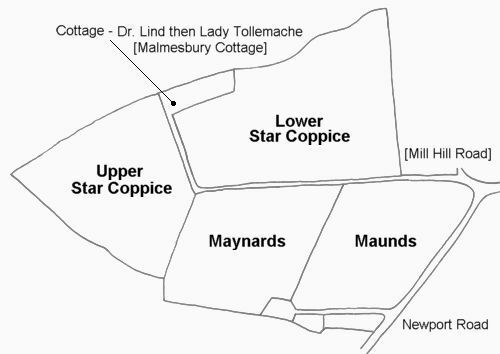 In 1812, Thomas Day (the owner of Maunds) was declared bankrupt and at an auction, held on the 30th June 1813, Samuel Osborn bought Maunds for �00, adding it to his other estates of Maynards, Upper (Further) Star Coppice, Lower (Hither) Star Coppice and Hat Field, which had been "heretofore part of a larger close of land called Upper Star Coppice". In 1816, Samuel Osborn died, leaving "a house and outbuildings a windmill the said cottage called Laurel Cottage and a barn with the apputenances called Mill Hill" to his two brothers, Vice Admiral John Osborn and Vice Admiral Edward Oliver Osborn [5 Feb. 1816; proved 14 Oct. 1816]. In 1841, after the death of Samuel Osborne's wife, the Mill Hill estate was put up for auction; two classified adverts in The Times describe the property, while one of them mentions "a stone-built prospect tower". And also the soil of the road or way separating the said two Star Coppices and leading from the mill Hill road to the messuage or cottage lately belonging to Lady Tollemache and then to John Eames Esq called Malmesbury Cottage. 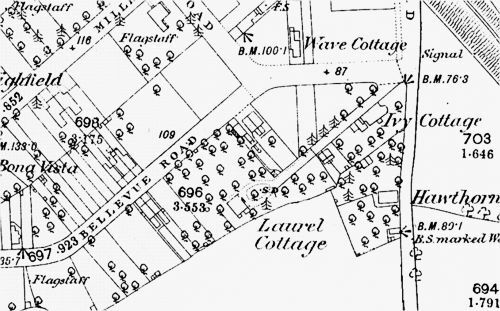 And also the soil of so much of a certain road or way leading from the Newport and Cowes Road to the above-mentioned Cottage called Laurel cottage and commonly called Whites Road as intervened between the north boundary of the eastern part of the land belonging to Laurel Cottage and the southern boundary of Maunds grounds. 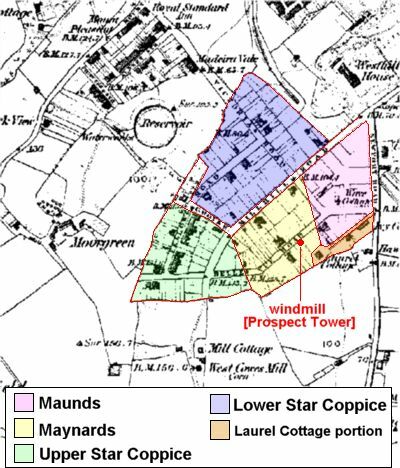 Although the windmill is no longer mentioned, plans accompanying an abstract of title to the estate make it clear that the windmill had become a viewing platform called Prospect Tower, used for pleasure by the Osborn family. 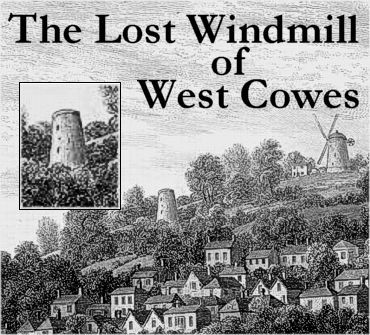 This is the tower to be seen lower down the slope in the engraving of West Cowes by George Brannon, shown in the title image at the top of this page. Detail of Prospect Tower taken from plan. Plan of the Osborn's West Cowes estate in 1842 at its sale to Major General Richardson. By 1842, the fields of Maynards and Maunds had been combined into one and become the pleasure grounds of Mill Hill House, having been converted into a 'lawn'. Prospect tower is still in existence. 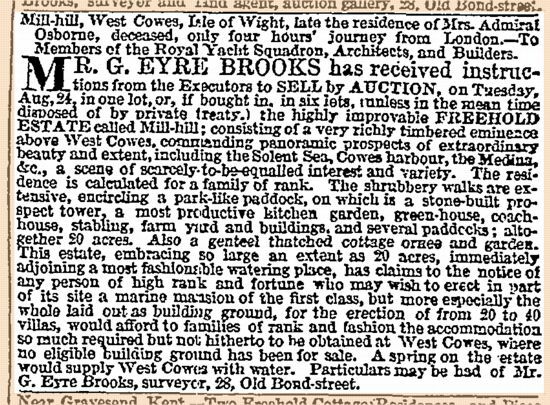 In November 1853, the estate was sold to Thomas Morland of Croydon Esq. and Conrad Wilkinson of Beckenham Kent Esq. for �184 19s 6d. and they started to develop the area. 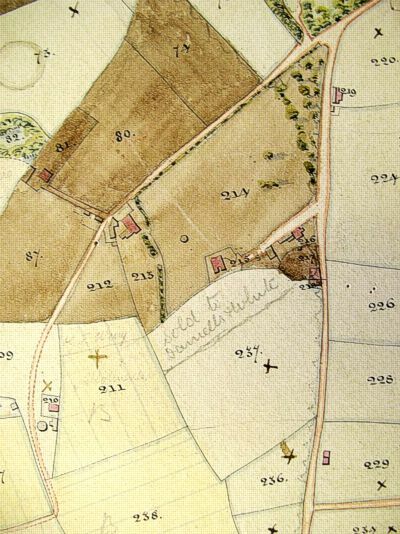 The 1862 Ordnance Survey map shows no trace of Prospect Tower remaining. Presumably it had been cleared to allow Bellevue Road to be laid down. In 1790 Thomas Haskell conveyed a holding called the Black Prince to Charles Kelleway, a baker. This was situated on the west side of the High Street on the site of the Cut. In 1796, Thomas Kelleway leased this property to James Buckett, a shopkeeper, for 11 years at � per annum under the proviso that Buckett bought all his flour, bread and other baking goods from Kelleway himself. The first mention of Thomas Kelleway in the Northwood Poor Rate books is in 1787, when he is paying 1 shilling for a property in Cowes. Kelleway married Sarah Young in 1785 and produced a large family. 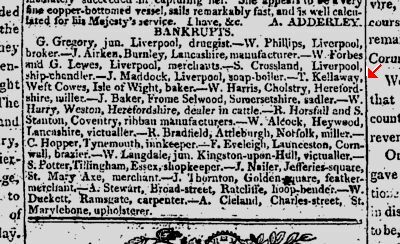 In 1811, Thomas Kelleway was declared bankrupt; the announcement being advertised both in the London Gazette [Tuesday 26 Feb. 1811] and The Times [Wednesday 27 Feb. 1811]. In 1807, Thomas took out a lease on a piece of land in Ryde situated on the west side of modern Nelson Place. It was then known as "Rope Walk or East Nelson Place". The land was described as "Piece of Land, Part of North Field, containing from North to South on East and West sides, 229 feet, and from East to West on the North side 77 feet, and on the South side 93 feet.". 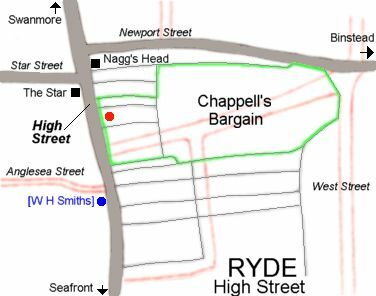 By 1814, Thomas Kelleway was occupying a property on the west side of Ryde High Street [LIND 351], where Woolworths is situated today [see red dot on plan below]. It is uncertain whether this Thomas was the father or the son. It does seem likely that Thomas Kelleway of West Cowes was setting up a new bakery business for his eldest son, Thomas, in Ryde, an area of expanding opportunities at that time. Ryde High Street Area c. 1830. Roads marked in grey : original roads. Roads outlined in pink : 19th century streets. Thin grey lines : boundaries of pre-1820 holdings. Green line : Original size of Chappells Bargain. Red dot : site of Thomas Kelleway's bakery premises. Thomas Kelleway of West Cowes died and was buried at Binstead on 4 April 1817. He was described at time of death as "of Ryde", suggesting that he had indeed transferred his sphere of business to Ryde. 1) John Lind of Westmont, Ryde Esq. and Elizabeth Lydia his wife. 2) Thomas Kelleway of Ryde, baker. A Census Enumeration dated 27 May 1821 for the town of Ryde lists "Thos. Kelleway: males 3 females 2 total 5". This included his wife, Hannah, but the other female may have been Thomas's mother, Sarah, who died in 1831 and was buried at Binstead. 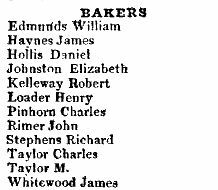 In Pigot's Directory of 1828, Thomas Kelleway is listed as one of eight bakers for Ryde. In The Vectis Directory of 1839, the Ryde listing contains the following entry: Kelleway, Thomas, baker and grocer, High-street. In 1844, Thomas also leased a property adjoining his bakery on the south, containing one messuage and premises [1 Oct. 1844. LIND 356]. Thomas died in 1847 and was buried in the newly opened Ryde cemetery along with his wife Hannah, who was buried in June 1851. Robert Kelleway, Thomas's second son, continued in the bakery business with premises in Cowes. He married Mary Ann Fellows, the daughter of a prominent Cowes family, on 18 May 1817. Pigot's Directory of Hampshire 1828. 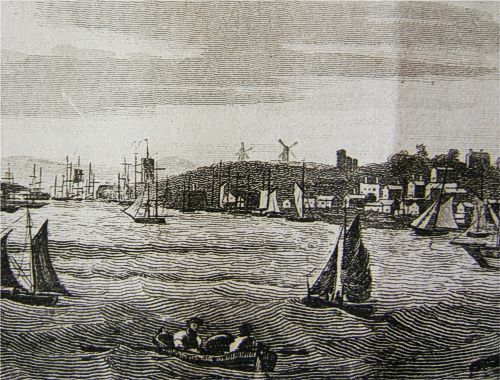 Thomas Kelleway, in a slightly viscious technology race against David Davis to set up the first windmill in West Cowes, borrowed money to build the first windmill in Cowes. However, his fertile wife had produced a financially frightening amount of children and the crushing economic pressures of bringing up lots of children, coupled with the stiff competition from the newly built, and more efficient windmill at the top of Mill Hill Road, induced him to close down the mill. His rival's windmill, being at the top of Mill Hill, meant that it was in a more advantageous position as far as wind coefficients, directions and dynamics were concerned. 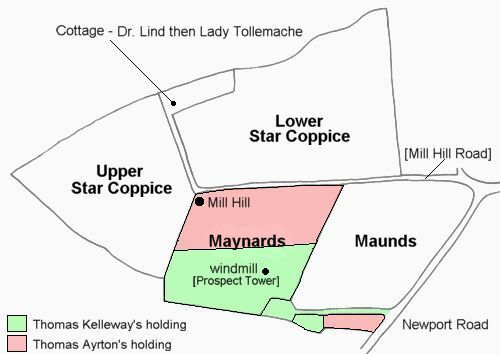 The crippling result of Kelleway's windmill venture left him in debt and so he sold Maynards to Admiral Osborne, who paid through the nose for it. Kelleway struggled on for a few years but, due to the high cost of teenage children, was finally declared bankrupt in 1811. However, Kelleway was a wily old fox and wasn't defeated yet. He realised that Ryde was a fast growing town with huge development opportunities. Buildings were springing up everywhere and this meant people. People meant food and food meant bread. He felt another windmill venture coming on. He found a plot of ground on the east side of the expanding town for the site of his windmill at what is now Nelson Place. But, oh dear, he had fallen into the same old trap as before: his site was some way down the slope of the large hill upon which Ryde is built. Windmills were built by more technologically knowledgeable rivals at the top of Ryde. Kelleway realised his mistake and never built his windmill. For the last years of his life, he remained in Ryde, a broken miller, running a small bakery business in the High Street. And yet, in one way, he was a success. Little did he know that he was in fact the builder and operator of the shortest-running windmill in the history of the Isle of Wight and possibly the whole of England. Original research by Alan Stroud. Hosted by Isle of Wight Industrial Archaeology Society.